Are you prepared for the challenges that can accompany surveying services? Control Point Associates, Inc. prides itself on delivering exemplary customer service. Below are some challenges our clients have experienced and how we resolved them. … you had to close on a property in 1-2 weeks, and you still needed a survey? The size and efficiency of our staff are the keys to our responsiveness and efficiency. Our 35 field crews, eight offices, and 135+ employees allow us to share resources across our footprint and deliver in a timely, professional manner. …you were concerned about the underground utilities on your project site? Our trained staff and state-of-the-art technology join to form an advanced and productive creative force. For utilities that cannot be seen from the surface, we employ electromagnetic detection, ground penetrating radar, and vacuum excavation where necessary. These techniques allow us to see under your job site and ensure that the work site is safe. … you were unfamiliar with the technology required to perform a specific survey? We always aim to satisfy, and we believe client engagement in our processes strengthens the company-client relationship. Count on us to give you a comprehensive run-down of all that we will accomplish on your property. Our trained staff will review the project with you and recommend the proper methodology so that you, the client, are entirely ingrained in our work. … the adjacent lot owner asked you to remove your fence from their property? Considering ourselves as consultants first, Control Point Associates, Inc. employs multiple licensed professionals experienced in boundary survey law in 15 states. CPA has been called upon and provided expert witness testimony for many cases involving property line disputes and resolutions. … you need to prepare a building model? CPA has recently upgraded our company’s building model technology. Our staff will employ 3D Laser Scanning and Building Information Modeling in Revit format, so the survey crew and clients can more efficiently visualize, plan, and design infrastructure. … you need flood insurance? We are well-versed in the process of preparing an Elevation Certificate, which is required to get flood insurance. We will walk you through the steps of acquiring this certificate to ensure that you are prepared for any storms that might disrupt survey and construction. Control Point Associates, Inc. is one of the nation’s largest professional land surveying, geospatial, and consulting firms. 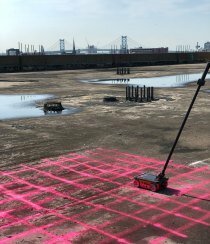 Here, innovative minds take on Traditional Land Surveying, 3D Laser Scanning, Mobile LiDAR, Aerial Photogrammetry, UAV, and Subsurface Utility Location services. Our mission is to provide high-quality, cost-effective services while delivering exceptional customer service to our clients. Contact us anytime, 24/7/365. We are always available to assist you with your project needs.